Denna söta 2 sovrum stuga ligger i mycket önskade Old Town Orange, en en mil kvadrat område som är centrerad runt den historiska Orange Plaza. Detta är ett fristående hus med privat gård och 1 privat parkeringsplats plus gott om gatuparkering. Stugan ligger centralt till alla Orange County har att erbjuda, som ligger bara 10 minuter från Disneyland och 20 minuter till Newport Beach och gångavstånd till Chapman University. Stugan ligger i ett lugnt område i grannskapet men är gångavstånd till otroliga restauranger och sevärdheter i hela området. Nice cottage, beautiful neighborhood, safe area. Easy to get to freeways to get to Disneyland, the beach, and colleges. Walking distance to Old town Orange for shops and restaurants, very quaint. Everything you need is in the cottage. Comfy beds. Enough grass for our little dog and sun for her to soak up in the backyard and nice patio table to eat outside. Great stay. Roomier than what you think! Very nice property. Ample kitchen and living area. With a quaint jack and Jill bathroom. Very nice part of town and very close to Disneyland. What a nice place! We were in town for a Chapman University event and it was great to be within walking distance. Beds were very comfortable, kitchen was well stocked. I even got to sit in the back yard for a while and listen to the birds. We will be returning. We moved to AZ from OC several years ago but still have relatives and our doctors in the area. A few times a year we like to visit for 3-5 days. We have two aging Labrador retrievers that I always hate to leave so finding this dog friendly place was a god-send. The little cottage and enclosed yard was perfect for them and very comfortable for us. It is centrally located and within walking distance to great little shops and restaurants . The neighborhood is fun to walk around and consists of many grand old estate homes and quaint bungalows cottages. We will definitely be back. Dave is a wonderful host. 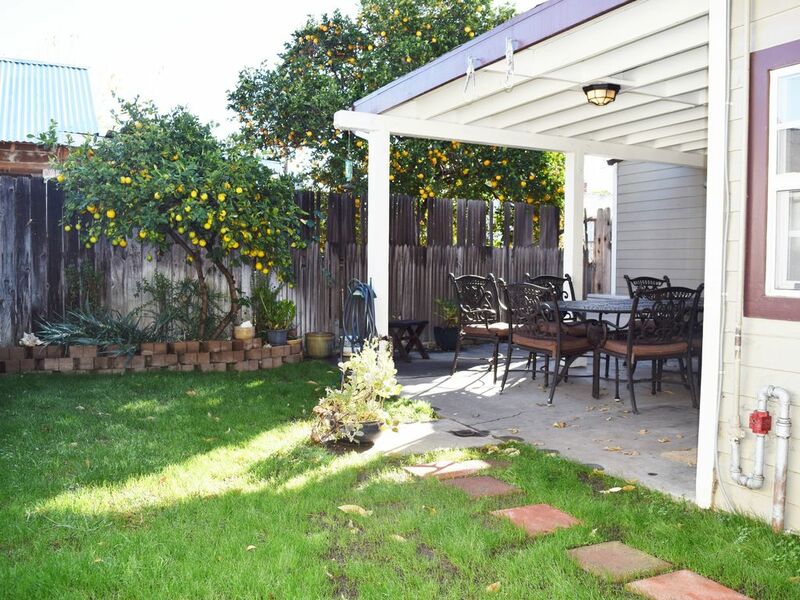 The house is on a quiet street within walking distance to Old Town Orange. The bicycle paths are easily accessible. We will stay again if the opportunity arises. Nice cottage, in quiet surroundings, private parking, lovely terrace. Well equipped kitchen, the bed of the master bedroom very comfortable. And the owner respond very quickly to our needs. Well located near Old Orange. Old Towne Orange är en mil kvadrat område som är centrerad kring den historiska Orange Plaza. Old Towne ligger centralt till alla Orange County har att erbjuda, ligger bara 10 minuter från Disneyland och 20 minuter till Newport Beach och gångavstånd till Chapman University. Old Towne är känd som "The Antique Capital of Southern California" med många antika, samlar, butiker specialitet och tesalonger ligger i hela området. Restauranger inkluderar Watsons Drug Store och Soda Fountain, PJ Abbey, Citrus City Grille, Rutabegorz, bensinstationen, Renata s Caffé Italiano, Byblos Café, Old Towne Grinder, två företag, Felix Continental Kafé, Tokyo Café, Haven Gastropub, Fran Gourmet, Blå Frog Bakery, Bagel Me, Gabbi s Mexican Kitchen, och Café Lucca. Specialitet mat inkluderar Rocky Mountain Chocolate Factory och Starbucks.